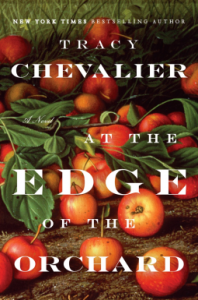 In her latest novel, Tracy Chevalier returns to Ohio, the setting of The Last Runaway, except this story is not about quilts but trees, from the humble apple tree to the majestic sequoia. The story begins in 1838, with Sadie and James Goodenough literally stuck in the mud in the Black Swamp, Ohio where they hope to stake their claim by growing an apple orchard. It is a truly bleak, inhospitable environment with bitter winters and the summer swamp fever ruthlessly claiming so many lives year in year out. James and Sadie are passionate pioneers but unfortunately their passions collide with devastating consequences – James with his devotion to his beloved sweet apples and Sadie with her lust for applejack, the strong liquor made from the inedible “spitter” apples. As well as this desolate Ohioan setting, we experience the excitement and wonder of Gold Rush California when, Robert, the Goodenoughs’ youngest son heads West but don’t expect a sudden reversal of fortune for the Goodenough offspring! This is a story about family, sacrifice, determination and the need to set down roots. There aren’t a lot of laughs but then the pioneers didn’t have an easy time of it. As in other Chevalier novels, there’s an impressive amount of research with the inclusion of real-life historical figures and wonderful attention to detail. The characters are flawed and not very likeable but all the more compelling as a result. Yes, this is a grim tale but amid the doom and gloom there is the tiniest glimmer of hope – a sense that those sequoia seedlings might take root and begin anew. My thanks to Penguin Viking and Net Galley for providing a digital copy of this novel for review purposes.